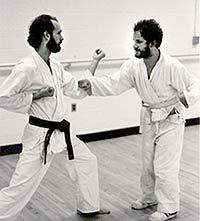 For years I taught karate at the State University of New York at Buffalo. Of all the students I have had, perhaps the one that has given me the greatest joy was the one I least expected. And he proved to be a great teacher as well. The story of Kevin goes right to the root of the concept of karate-do. While most people think students of karate are tough and well coordinated, it is not always so. If the practice of karate can develop and aid in personal and spiritual self-improvement, then shouldn't karate be able to benefit more people than just those who are already strong? I was stretching one evening just before the karate class I instructed in the University's athletic center when a young bearded man in a wheel chair wheeled over to me and said something. "Kaaan ah stuuuudeee Kaa raah ahhhh te?" he asked. Later I found out that his voice and body coordination had been distorted by the effects of cerebral palsy he had since birth. At the time I had to listen several times to understand that what he was asking was whether he could study karate with us in class. I had to think for a few seconds, for I had never worked with a handicapped student much less one in a wheelchair. When I replied I said, "sure you can study, but only if you help yourself and if you fall you will have to get up yourself." He seemed surprised. He later told me that he had tried to join many other activities but had always been turned down. He had been especially sure no one would teach him karate. But Kevin did study with us. At the beginning of every class he pulled himself out of the wheelchair and with his legs bent inward, arms waving for balance, he began. His movements were uncoordinated and often he fell, but he would get up and keep trying. Later he thanked me for not trying to help him. He explained that by treating him equally it made him feel he belonged. Day by day the changes were almost imperceptible, but over time the change was noticeable. His balance improved along with his coordination, strength and even his speech. He began to come to class early in order to practice walking up and down the stairs within the athletic arena. Not only did this help his coordination but it strengthened his legs. Kevin explained that exercise was especially important for those with cerebral palsy because without it, as people aged the body could quickly deteriorate. At Christmas time his second year I got a holiday card from Kevin. It was perhaps the most memorable one I have ever received. In large, uneven letters, across the inside was the message: "Thank you for letting me try." Although Kevin is still handicapped physically, his spirit is tremendous. He also has a sharp wit and sense of humor although his speech difficulties often hide it. Two years ago, after more than eight years of practice, he traveled to our organization's New York headquarters to test for shodan (first degree black belt). I was so proud. During the promotion he was asked to do a kata before all the other black belts in attendance, around 100. He did, and his movements although awkward and still hesitant were pretty good. Afterwards everyone got to their feet and applauded. What observers didn't realize is how Kevin measured his own success. 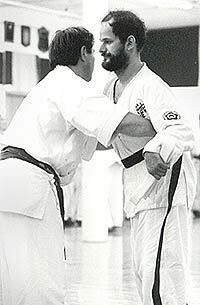 He later asked me, "Do you know what I tried to do hardest in my kata?" "No," I replied. "Just not to fall down," he said. Kevin has taught me never to make quick judgments and never to underestimate someone. He has also taught me that each of us is very different and that each has his or her own strengths, weaknesses and goals. Karate helped him become stronger, better coordinated and helped him feel he could fit in and accomplish something he had set out to do. Now he doesn't always have to use his wheelchair either. Often when he came to class, he left the chair at home and walked to the bus that brought him to campus. Being mostly a solo activity, Karate thus proved to be an excellent form of physical therapy. And in Kevin's case it also helped him develop spirit and self-discipline. Perhaps it is something that more people with coordination and body control problems could benefit from. Lest you think Kevin didn't also learn self-defense, let me relay an incident that occurred on a downtown street in Buffalo. Someone had picked Kevin, a slight man in a wheelchair, as an easy target to rob. But when he tried to grab Kevin's waist bag, the attacker got the surprise of his life. The victim grabbed back. While pulling the robber forward and down with one hand, Kevin's other hand in a fist met the attacker in the face. By the time several people from a nearby store reached the pair, the attacker was on his back on the sidewalk with Kevin sitting over him, threatening to hit again. 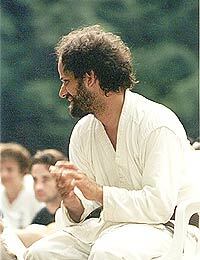 Last year Kevin demonstrated a bo (six foot wooden stick) kata at a tournament in Ithaca, New York. Afterwards I talked to the audience about Kevin. "If you are a student of karate perhaps you know the motto, 'If knocked down seven times, get up eight.' It's a motto about perseverance. But most of you don't realize that just to be able to do the simple things like walking and standing we all take for granted, Kevin literally has fallen down thousands of time and gotten up thousands of times -- something few of us here would ever be willing to try. He is an example of spirit, someone we can all learn from. So the next time you feel frustrated by something, feel the world is against you, think of Kevin and his spirit. It will make your challenge seem a lot easier." Right after me another instructor also got up to talk about Kevin and how his efforts inspired him. "When I saw Kevin perform his kata, I started to cry," the instructor began. But before he could continue Kevin lightened the moment. In a loud voice Kevin asked, "Was it that bad?"